Want our experts to call you? Get IAF Approved ISO Certification from JAS-ANZ, DAC, EGAC, IAS, UKAS. we help you to match your requirements and needs to the ISO certification procedure and manual. 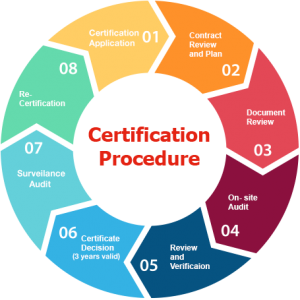 we provide you a complete set of ISO certification services with worldwide affirmation that increase your efficiency and presence in the world. and you will get soft copy of the certificate within 3 working days. We are committed to maintaining confidentiality of the information & documents shared by our prospective customers with us. Consultants help and advise. Good consultants are similar to trainers and coaches. We work with you to help you understand what is required and do what is necessary for your quality system to reach the required level. CONSULTANTS Prepare and coach you. Help you get your system ready. Advise you where you have gaps, plus explain and show you how to fix the gaps, or even do it for you. Advise, teach, guide and help you throughout the process. Prepare you and show you how to meet the various requirements. A person with the skills and experience to audit a quality management system. Where a consultant is like a coach, the auditor is the examiner. And never the twain shall meet: certifiers cannot consult or advise you. Auditors work for certifiers: the companies who award the certificates. Certifiers are private organisations (not government bodies) who are accredited to award certificates and are service providers. In Australia, they're usually called 'certifiers', whereas in the USA they are usually called 'registrars' or CBs (certifying bodies). Auditor's Audit your quality management systems. Decide if the system meets all the requirements (complies with) of the relevant Standard. If so, recommend that a certificate be awarded. Issue the certificate. Return and re-audit the system at intervals to make sure it remains compliant. BEST ISO CERTIFICATION deals with the fundamentals of quality management systems. We are providing certifications to all kind of organisations. © Copyright - 2017 - www.best-isocertification.com : All Rights Reserved.